What exactly is worship? That’s a question I’ve been asking myself a lot lately. Nearly every passage in the Bible that uses the word worship uses it in context of the bowing down before God, a king, or a ruler; Paul says that working as unto God can be worship, but in our modern worship services we attribute worship as music. Honestly, I’ve felt a disconnect with modern praise and worship but haven’t been able to put my finger on what it is, until reading this book. 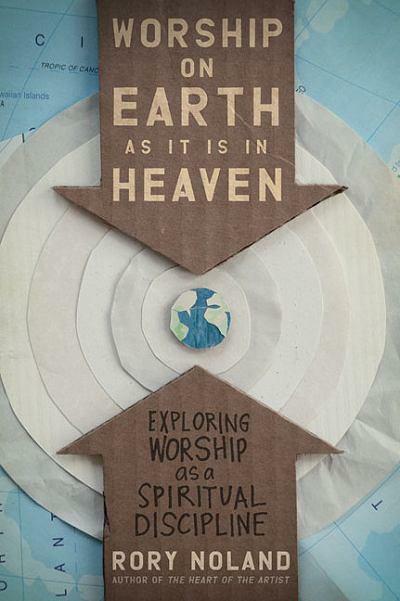 In Worship On Earth As It Is In Heaven Rory Noland makes the assertion that worship is the physical part of praise. I’m generalizing a major study and explanation when putting it that simply, but that pretty much sums up where the disconnect has been for me. I’m not always physically engaged in my worship. Sometimes I get so moved in adoration and love of God that I lift my hands, and there have even been times where I’ve been so awed and afraid that I’ve fallen prostrate in His presence, but I never got that these were moments of worship. To some extent these feel like moments of natural worship, I mean everyone will eventually bow their knees and worship Christ as Lord, we cannot help ourselves when we’re overwhelmed by His presence, but now that I know what worship is, I want to choose to do it. Next time the decibel level of a worship bothers you, take a moment and look at what worship in heaven is going to be like: flashes of lightning, peals of thunder, people shouting at the top of their lungs, and the lead worshipers (seraphim) around the throne shake the ground with their cries of “Holy, Holy, Holy”. If loud worship makes you uncomfortable, heaven certainly will. Worship in heaven will be multi-ethnic and multi-generational. We’ll be worshipping alongside people from every tribe and language and every generation that’s ever existed. If style and taste in music were really an issue in God’s eyes, that would never work. Real worshippers worship in Spirit and truth, not according to tastes in music. If you can’t worship God in a range of music styles from Country to Rap to hymns to tribal chant, you’re missing the point. We worship Him because He’s God, not because the music moves us or even because we can sing better in one style over another. You give god your best no matter what. Worship is participatory. There will be no pews to sit in in eternity. The only one who sits in heaven is God on His throne. He’s the only spectator. Everyone else participates. I highly recommend Worship On Earth As It Is In Heaven if you can find it. In fact I highly recommend worshipping on Earth as we will in heaven. God is worthy! Very thought provoking Stephen! I'll be interested in your continuation.